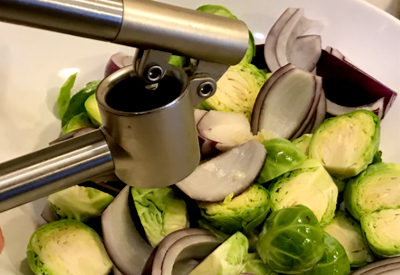 If you haven’t tried Roasted Brussels Sprouts you must give this recipe a try! It took me over 35 years to try Brussels Sprouts. As a child and young adult I had no desire to ever put a mini cabbage-looking green vegetable on my plate. Roasted Brussels sprouts served with air fryer ‘grilled’ chicken. However, as I have become older, my courage to try new and different foods has increased. For example, I would never eat avocados. I was disgusted by the mere look of guacamole . There was no way I was going to put what looked like stage 2 baby food in my mouth. That was until I was at a Mexican restaurant and someone at the table ordered chips and guacamole. I have always loved the hot and crispy tortilla chips that are served as soon as you sit down. But I have always enjoyed them dipped in Mexican salsa. First cut the ends off of the Brussels spouts and then cut each one in half lengthwise. Instead, on the table sat a bowl of mashed avocados mixed with a little red onion. I nibbled on the tortilla chips and after a little (or maybe a lot) of coaxing from my friends, I dipped a chip in the guacamole. I had my drink right beside me ready to wash down the anticipated nasty taste that was about to happen. After a very small nibble, I was pleasantly surprised. Using a garlic press makes mincing garlic a breeze! Seriously!!!! I absolutely loved the taste so much in fact, we make our own guacamole all of the time! Click to see our guacamole recipe. And that is pretty much the same scenario on how I became to love Roasted Brussels Sprouts. 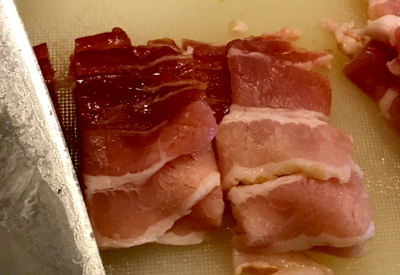 Cut strips of bacon into 1/2 inch sections. I was in the middle of a low-carbohydrate diet when we attended a family reunion. My food options were very limited. There was cheesy potato casserole, green bean casserole, pasta salad, potato salad, and more! Each side dish was filled with carbs. But down the food line I spotted a bowl of roasted Brussels sprouts. I wasn’t thrilled, but I was desperate. One peak inside the serving bowl and I knew I was in for a treat. Layer your mixture in an oven safe container or on a lined rimmed baking sheet. 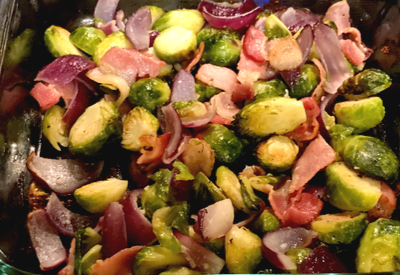 The Brussels Sprouts were lightly browned and were scattered with red onions and bacon. Like the saying goes, bacon makes everything better!!! So I scooped up a serving and gave them a chance. The oven cooked the Roasted Brussels Sprouts to perfection! They were fork tender yet slightly crisp on the outside. 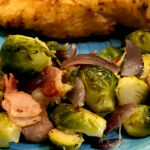 Roasted Brussels sprouts with onions and bacon – a fantastic side dish! The red onions had begun to caramelize, giving this side dish a magnificent flavor! 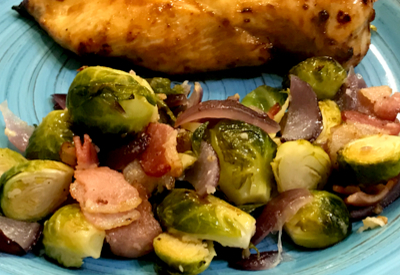 And yes, the smoky flavor of the bacon was infused throughout the dish, making my first Roasted Brussels Sprouts experience a fantastic one! Since then, I have been making this side dish at least once a week. It is a great way to take in additional green leafy vegetables. And because low-carb/Keto diets are so popular, it is one of the most requested recipes at every pot luck that I attend! 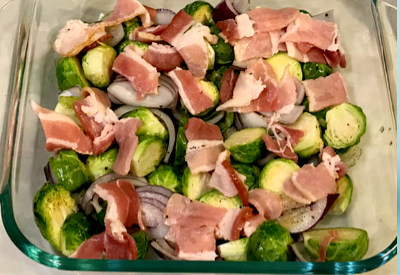 A delicious roasted Brussels sprouts recipe that is seasoned with red onion and bacon and cooked to perfection! Line a rimmed baking sheet with aluminum foil or grease a 9 x 13 baking dish. 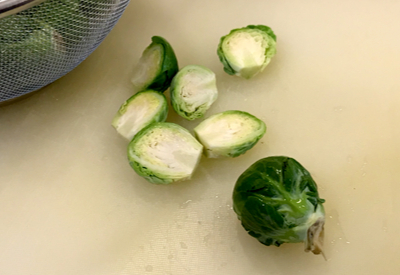 Cut the stem off the Brussel sprouts, slice each one in half lengthwise and remove any loose outer leaves. In a large bowl add the cut Brussels sprouts and onions. Mince the garlic over top. Sprinkle the mixture with the salt, pepper and red pepper flakes (optional). Drizzle the extra virgin olive oil on top. Toss the mixture until well coated. Spread the Brussels sprouts mixture on the prepared baking pan in a single layer. Add the cut bacon pieces over top. Bake for 20 to 25 minutes, until the sprouts are fork-tender. Taste and season with additional salt and pepper if needed.